Every year at the beach all the Russ boys grow out their beards and then shave them into crazy patterns for their annual Russtache event. This year, Blake and Annalee decided to let everyone else get in on the Russtache action. The Russtaches get better and better every year with crazy and unique designs. 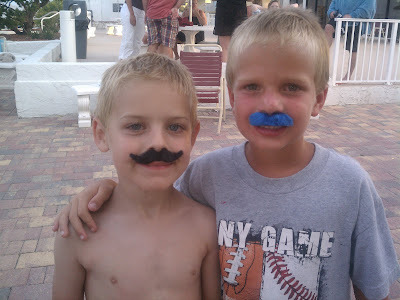 oh, the nastiness and the awesomeness that are combined in the russtaches!! i LOVE it! And i love ALL your posts. You are awesome, Em. Your sweet post about your grandma made me cry. I loved the poems and the sweet relationship you two had. your grandma could tell from a very early age that you were a pretty awesome person!! I'm lovin' the recent surge of posts form the Russ clan! keep 'em coming! I have to agree with emilyaaa. Please keep posting. Maybe like 12 times a day. I have no words for the russtache contest.